Zodiac is a new monthly event bought to you by the Hottie Cooterati Experience and, of course, as the name gives away each cycle is based on an astrology sign. This month's sign is the Leo. Leo's being represented by the Lion, often consider themselves to be the monarchy of humanity, stubborn, fierce and often relentless in their pursuits of grandeur and dominance. They will never back down from a fight and generally live by the motto of what you see, is what you get. Yet like all signs, there is polar side to their personalities. Leo's are warm of spirit, eager for action and driven by their desire to be loved. Proud and loyal, when a Leo loves you, they love you with everything they have. It's right around the corner! Shopkeepers are burning the midnight oil, putting on the shine, pulling out all the stops, polishing the racks, rolling out the carpet, and bringing out their finest vintage fashions and retro wares for your shopping pleasure. It's Vintage Baby! And with three full sims bursting at the seams with awesomeness, the Vintage Fair 2012 is going to be an event you won't want to miss! Today is the last day to take advantage of Hair Fair 2012 and it's also Bandana Day. What is that? It's a day dedicated to all the people who lost their hair due to illness or medical treatment not wearing a hairstyle but a Bandana. In all the Hair Fair sims you can find several stalls where a great variety of bandana made by several designers and residents are available. They are sold for 50L each and proceeds will go to Wig For Kids. Let's show our solidarity then, we can be pretty wearing a bandana and it can be turned in an amazing fashion accessory when the day is over, adding hairbases or braids attachment. This will be my last Hair Fair post for this year, I would have loved the opportunity to show you more but sadly time is running out as Hair Fair is in it's last day for 2012! As always, its been an absolute pleasure to be a member of the blogging community promoting Hair Fair this year and just when you thought it was all over just remember only 365 days until Hair Fair 2013 :D! I simply can't walk past anything created by Anya Ohmai and her hair at Hair Fair this year was true to form. I think these three styles were the only non mesh hair I purchased all fair but they were simply too cute to say no too! You can always count on LeLutka to come up with something on trend yet new and exciting, Salome is possibly one of my favourites of the fair this year, totally worth checking out! Other purchases from Hair Fair 2012. Please remember that buying hair at Hair Fair will help in raising funds for the charity organization Wig For Kids. Due to my technical problems, I'm showing only a selection from each designer, but all of them have many other styles available. My fight against overheating is not over yet and I must confess that usually it's the laptop who wins, not me... I rarely manage to take more than one or two pics, sometimes I just dress up and it's already melting, wtf? Besides that, Hair Fair 2012 is still running for a couple of days, and I want to show you some more styles I love before it ends. I'll try to do another 1-2 entries by tomorrow, that is July the 29th, Bandana Day, a day to show your sympathy to the people who lost their hair wearing a bandana. Today I'm sharing with you something from EMO-tions and Sugarsmack. Let's have a look! Please remember that your purchases at Hair Fair 2012 will help the fund raising for Wigs For Kids. This hairstyle has the lovely feature of being 2 in one. When you are tired of your long curls on your back, you can just tie them up with a click! Hair Fair is heading into its last 24 hoursish so now seems like the perfect opportunity to remind of you of some of the amazing styles that have made this years Fair a roaring success. Lamb has 4 female styles and 1 male style up for grabs at Hair Fair this year. If you read my blog regularly you will know I'm a huge fan of all things Lamb and this years offerings are no exception, however I wouldn't be doing my job properly if I didn't warn you that there is a slight rigging problem with the Wild at Heart and Blue Velvet styles. This doesn't impact the wearability of the stunning hair styles generally, but some poses will cause the hair to disappear into the side of your head. With Hair Fair for 2012 drawing to a close in the next few days, it is time for me to battle on through illness and injury to show you some more of the spectacular goodies available. Kavar Cleanslate from Exile really excelled himself this year with 4 stunning hair styles that I just couldn't say no to! If you haven't been to Hair Fair yet you have until the 29th and really should get your behind over there. Sometimes I do my best work when I'm supposed to be sleeping... unlike other people who do amazing things all the time. I'm talking about the new Cassiopea skin by Aida Ewing of Glam Affair, and (wow!) this is a gorgeous skin! She's a darker shade than I normally would wear, but being half asleep I bought the wrong one, and now that I have her, I'm absolutely in love with her. The rest of my ensemble was gathered together mostly at Collabor88, so hurry over while they've still got the current collection, or you'll miss out on some great deals! Feeling like a goddess, I went in search of a beautiful and surreal place to take pictures in and found the Mysterious Wave art installation. Cassiopea Skin - India 04 by Glam Affair NEW! 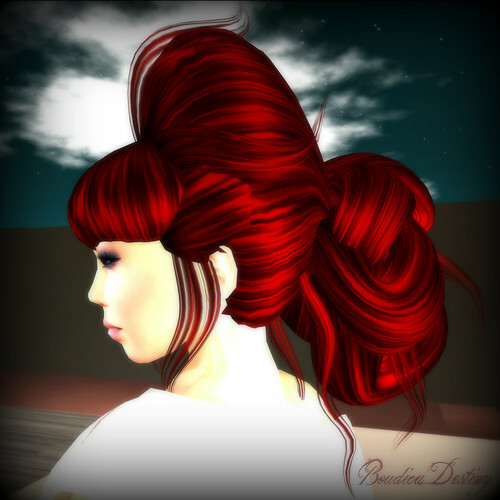 Nita Bracken of Tameless has been at it again, and now you can find 5 beautiful new Tameless hairstyles right now at the Hair Fair. Find the Tameless Booth on the Hair Fair - Garden sim. 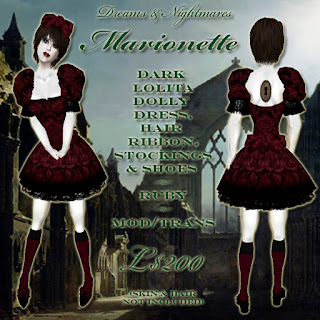 I'm combining them with some great new partial mesh outfits from Chandelle. The whimsical designs include a mesh off-shoulder tops with skirts and some with belts. Hello everyone, I am fine and alive and still trying to blog: I have plenty of stuff from Hair Fair to show you! Only thing, I'm experiencing MAJOR overheating problems on my laptop, which is why I'm getting slower and slower. Please be patient with me, be sure I'm doing my best. Hello my sweets, firstly I must apologise for the lack of posting and particularly for the delay of posting for Hair Fair. Shortly after my last post, I pinched a nerve in my back and shoulder which rendered me pretty much useless. Fortunately I'm on the mend now and have lots and lots and lots of hair to inundate you with... aren't you lucky? With 4 amazing styles (3 female, 1 male) on offer this year, I really couldn't go past epoque meshy goodness, you really shouldn't either! Next up is the always amazing Wasabi Pills. I have to be honest, I didn't really know a lot about Wasabi Pills until mesh launched, but MissAllSunday Lemon has smashed mesh hair out of the ball park and I just adore her for it. She also has 4 amazing styles up for grabs at Hair Fair and I love each and every single one of them! Today it's Clawtooth, one of my favourite hair stores ever, which is offering some amazing brand new mesh hairstyles at Hair Fair 2012. Please remember that purchasing hairstyles at Hair Fair 2012 will help in raising funds for the charity organization Wig For Kids, that provides wigs to children who lost theirs because of illness or medical treatments. Today I wanted to just log in quick and share a few things, but I got swept away in the moment. It's something that Sea and Sky and Sand always do to me... even in a virtual world. Sending a big thank you out to Strawberry Singh for her PicMonkey tip, without which these pictures wouldn't have nearly as much awesomesauce. Wow what a big difference a few clicks can make! Thank you Strawberry! 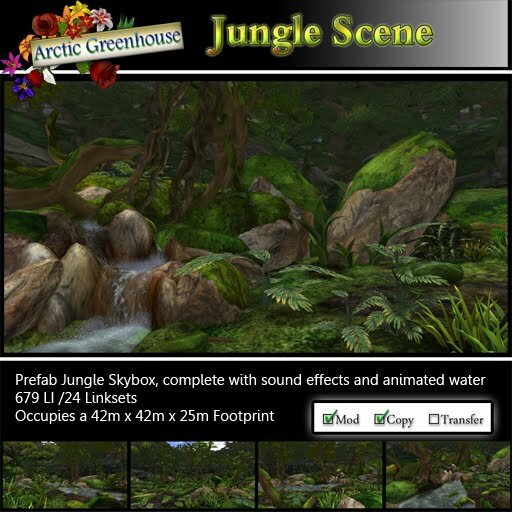 New Mod/Copy Prefab Jungle Skybox Scene, complete with multiple sound effects, animated water, and more! 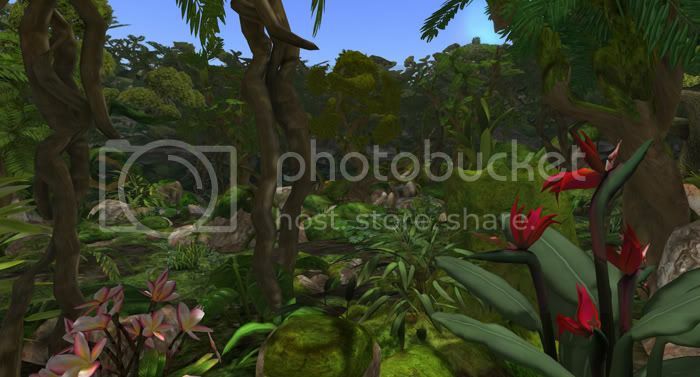 Multiple ambient jungle sounds, water sounds, and water splash effect. 679 Land Impact/Prims used, occupies a 42mx42mx25m footprint. There is (roughly) a 15x20 square area in the center that you can unlink the plants/rocks/ect from and "clear out" to place a small building if you choose. I've had to take a break from Second Life for a few months, in order to concentrate on getting my RL health back on track. Curio's Gala Phoenix is currently in the midst of legal issues which have resulted in her content being removed from the grid, pending the outcome of her legal battle. The Digital Millennium Copyright Act (DMCA) process in Second Life requires that when there is legal action taken against your content, Linden Lab will remove it from the grid until a ruling is made. Gala's fellow content creators have come together to host a fundraiser to help with the substantial legal costs she will incur in contesting these baseless claims. This fundraiser, One Voice, is currently underway on the Mesh sim, and runs through July 22.